Kirby Wolf was one of my closest friends when we were in junior and senior high school at Great Neck North. 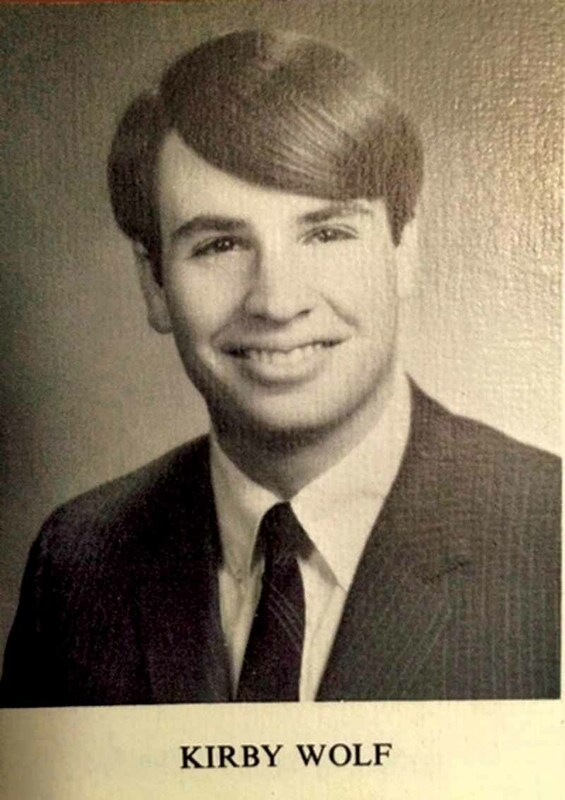 Nearly everyone in the class of ’67 knew Kirby; he was a genial fellow. But, it was our times together outside of school that set the bond of my friendship with Kirby. We spent many hours at his home on Shore Drive in Kenilworth, just a few blocks from mine, discussing Eastern religions, music, art, literature and much more. Kirby’s house was ideal for many reasons, including the impressive collections of mostly modern books and works by famous artists that his parents had assembled. The Wolf house was like a second home to me. At its entry was a small carpet with a design by artist Joan Miró. Kirby’s mom, Marcia, wove it. The house was designed by noted American architect Edward Durrell Stone and it featured heated slate floors, a floating staircase and tall windows with spectacular views of Long Island Sound. I was devastated when it was torn down in the 1990s and replaced by a metallic monolith. Kirby’s family was a big part of my high school years. Kirby’s dad, Stanley, owned a recording studio in Manhattan, and he was happy to talk to me about his books. I learned a lot from him that is still valuable to me in my career as a book dealer. We spent hours in Stanley’s library discussing first editions, illustrated art books and illuminated manuscripts. Marcia, who was like a second mother to me, would prepare simple but delicious treats—like chilled apple slices with honey—to snack on while we chatted. But, it was the time Kirby and I spent together talking that made the greatest impression on me. Kirby and his older sister, Liz, shared a two-bedroom suite at the rear of the Wolf house. I had a crush on Liz and always hoped she would be around when I visited. the soft rope of her dark hair as she entered and just as quickly exited. Kirby and I resumed our conversation, but the rest of our talk is lost to my memory of Liz. In contrast, I clearly recall another conversation we had on the bus ride home from school one day. We were in the first half of ninth grade in junior high. It was an overcast day in November. Just before Mr. Thiergard’s late-morning class was about to conclude, before he could give us our “brew,” an announcement came over the public-address system: President John F. Kennedy had been assassinated. I remember being confused and crying as I got on the bus. Kirby took the seat next to me. He was crying, too, but tried to comfort me. He said that only a crazy person would shoot the President and the country would be all right. I never forgot that. After high school, Kirby and I stayed in touch periodically. He managed his father’s studio for a time and then ran the English-as-a-second-language program at Pratt Institute in Brooklyn, before moving to Boca Raton, FL. Most recently, he relocated to Maine, near his sister. Kirby remains a good friend of mine; time and distance cannot change that. With the rest of his classmates, I look forward to reconnecting with him at the reunion in June. And some day, before the passage of too much time, I hope to see Kirby’s sister again, too. The GNN Class of ’67 50th Reunion will be held at the Inn at Great Neck from June 9 to 11. Request information or email pictures and memorabilia that will be displayed at the reunion to gnn67fiftieth@yahoo.com.